Both take place during our morning services. You are entitled to have your child baptised at the church if you live in the parish or are on the electoral roll of the church. Thanksgiving is a service for those who wish, quite simply, to say ‘thank you’ to God for their child. Prayers are said, the child is named and blessed and a gospel is given which tells the story of Jesus. The advantage of a Thanksgiving service is that it gives parents more time to think through the importance and significance of baptism. Christening is for those who want to state their desire to bring up their child as a Christian. It therefore involves words of commitment to Jesus Christ and to church. As well as the words of commitment, the child is named, water is poured over the child, and prayers are said. Christening is the mark of being part of the Christian Church. Families bringing their child for christening hope that one day their child will be confirmed and make this commitment to Jesus and the church for themselves. You will need to think very carefully about this service as you will be asked to make a clear and personal confession of the Christian faith. Godparents are those who agree to be especially concerned for their godchild’s spiritual development. Ideally, they will be committed to pray for them. You need at least one male and one female godparent. They need to be baptised and worshipping members of a church. Why not visit www.egodparent.com - a helpful site as you consider who to ask. Once my child has been christened, have I completed my Christian duty? No, it’s only just begun! 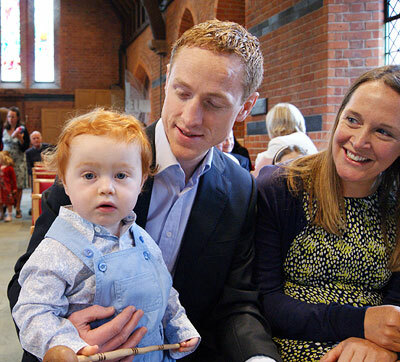 At baptism, parents and godparents commit themselves to help the child grow up as a Christian, believing and trusting in God. Parents will need to encourage their child to come to church, read the Bible and pray if your child is to continue in the Christian faith. Is my child ‘worse off’ if I choose Thanksgiving? God loves everyone, whether your child has had a service of Christening, Thanksgiving or nothing at all. If you are uncertain, chat to the minister and he will help you make the right choice. What if I want ‘christening’ but don’t feel I can make a full commitment to Jesus Christ and his Church? It is important that at least one parent is able to say the baptismal promises with integrity. If neither of you can do that, then it is best to have a thanksgiving service or wait. Waiting can be a good option. There is no hurry to have your baby ‘done’! You may want to think more about the implications of Christian faith for you and your family. If so, why not find out more? Contact the Vicar to arrange a time to meet with someone to talk about the next step for you. If you have not been to a service at the church before, come along to our service which starts at 10.45am each Sunday. The service lasts an hour and would be an ideal opportunity to get a feel for what you are undertaking. If you decide to go ahead with baptism, you will need to read and engage with a range of material and meet with a member of our team to talk about it. A date cannot be booked until this meeting has been completed.